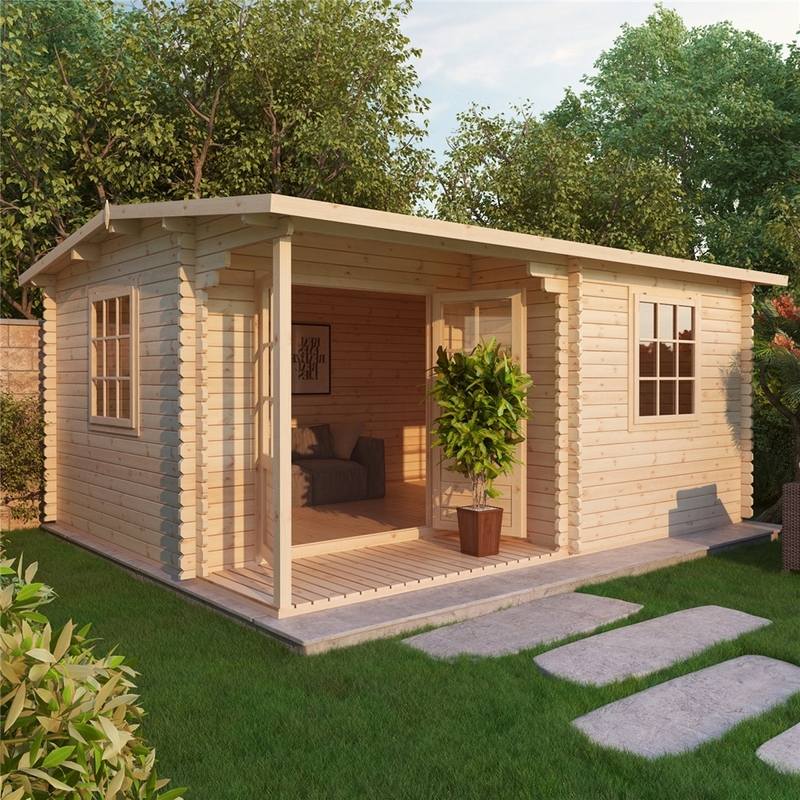 This log cabin is an attractive addition to any garden and provides generous space for a variety of uses, offering a possible place in which to relax, study, work out or entertain. This striking design is considerably great value for money, extremely adaptable, stylish and a creative solution for your garden space. 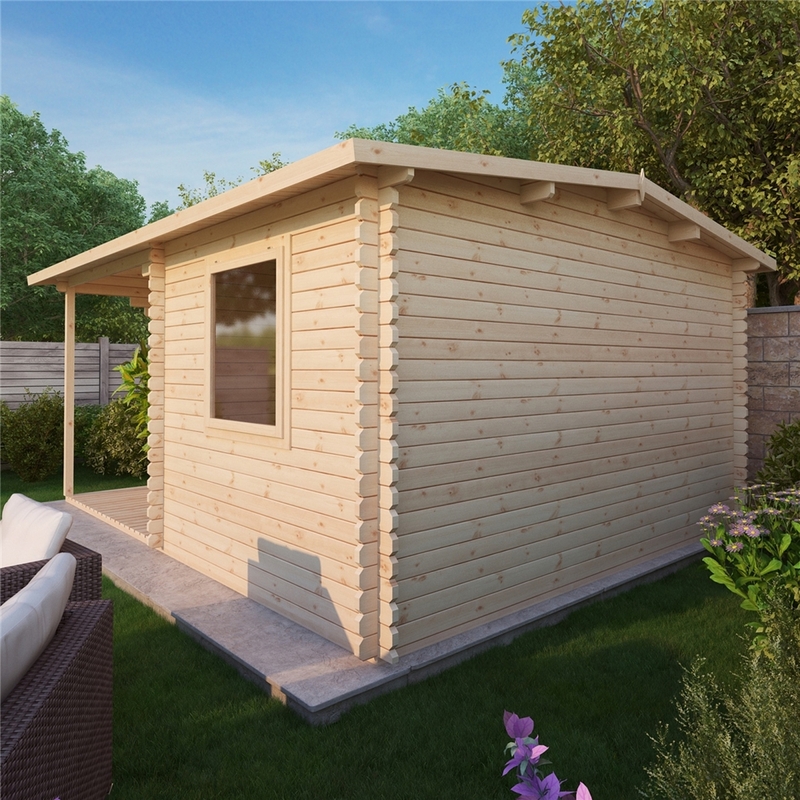 Construction consists of 34mm thick (28mm, 44mm also available) high quality softwood with double tongue and groove joints and wind tight chalet-connections from corner to corner. The door is made from laminated wood and is supplied with cylinder lock and handles. Both the door and window are glazed with single sheet glass (double glazing is also available). 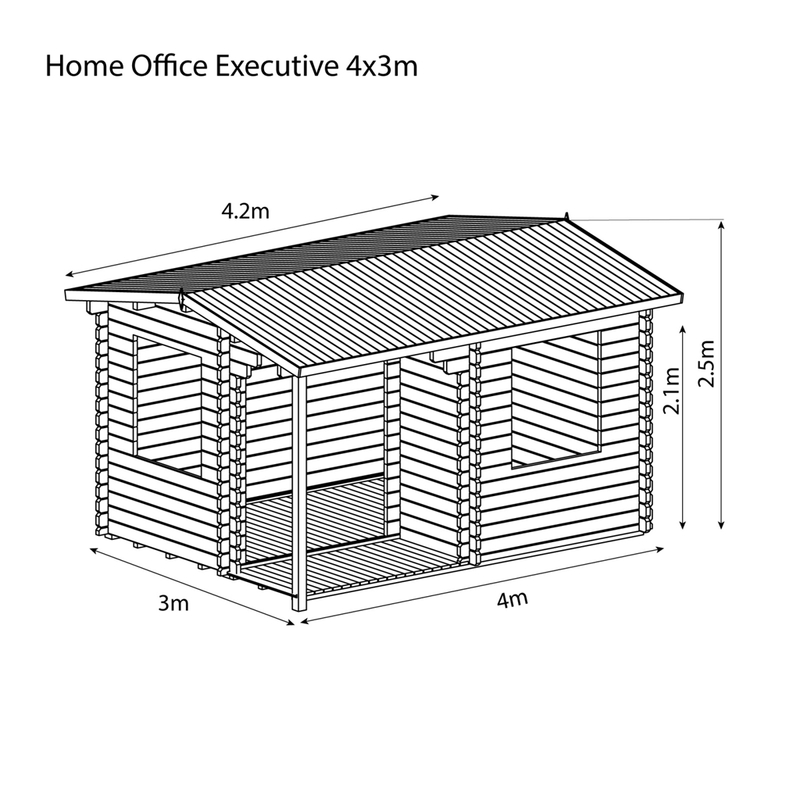 The cabin will be delivered untreated giving you the choice to decorate the building as desired to your own personal taste whilst adding protection to the building. Buildings which are untreated do naturally grey with age within around 12 months; therefore we highly recommend that you treat the cabin during construction with a high quality preservative and at regular intervals according to the preservative manufacturer's instructions. The log cabin will be delivered with temporary packaging to help protect it during transportation. Although it is an outdoor product, the wood should be treated or kept dry during the installation process. We recommend that any timber left outside is covered immediately after delivery to avoid any blue stain issues. The floor is constructed with pressure treated bearers for maximum strength and includes a FREE floor. Your building will come complete with full instructions and an assembly kit. The log cabin is to be constructed on a firm level base whether that is solid sheet concrete, concrete slabs or tantalized bearers. 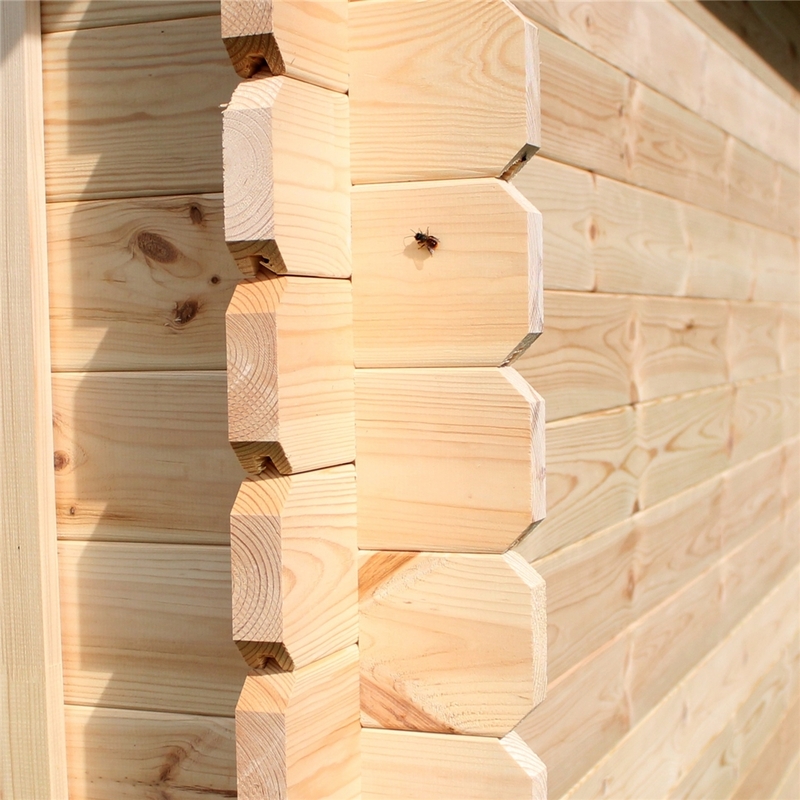 We have a team of installers who have over 30 years experience in the constructing of log cabins. 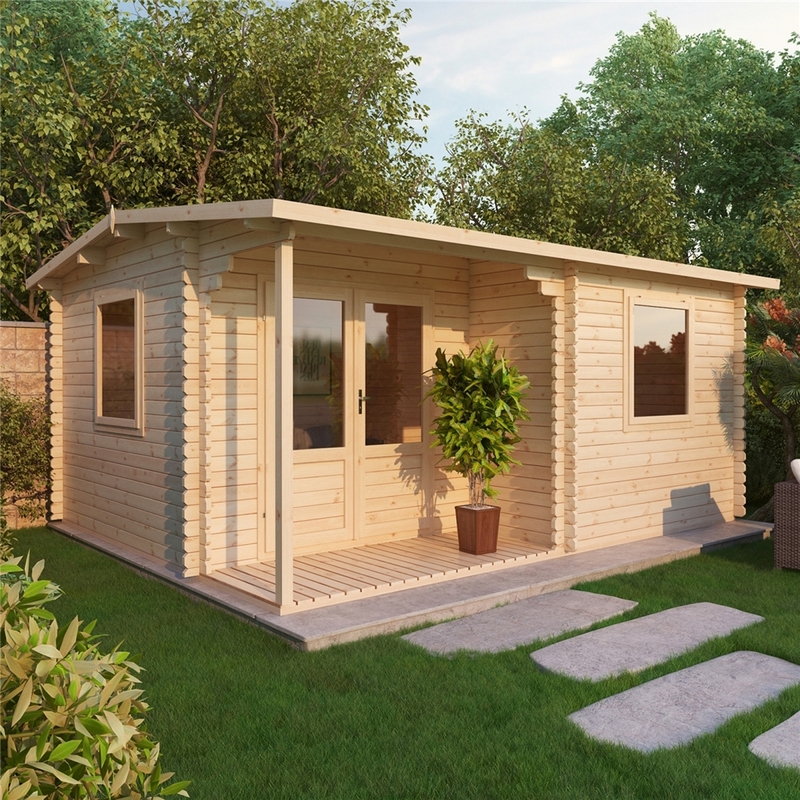 The team are professional and friendly and ensure a stress free build of your cabin. It is important that you prepare your base prior to the team arriving to construct your log cabin. 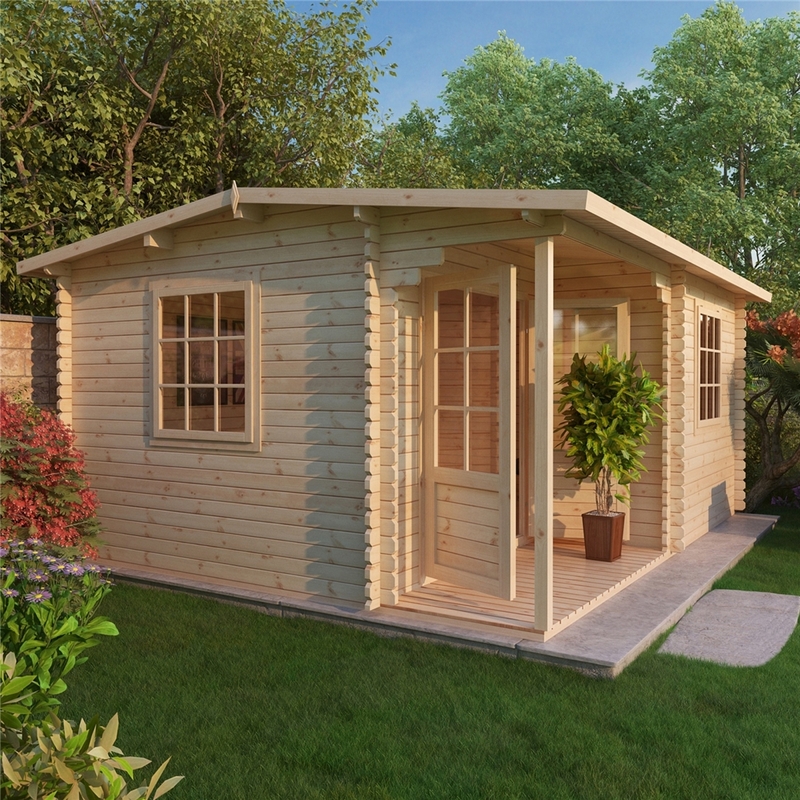 We would usually deliver your cabin the day prior to the install team arriving. 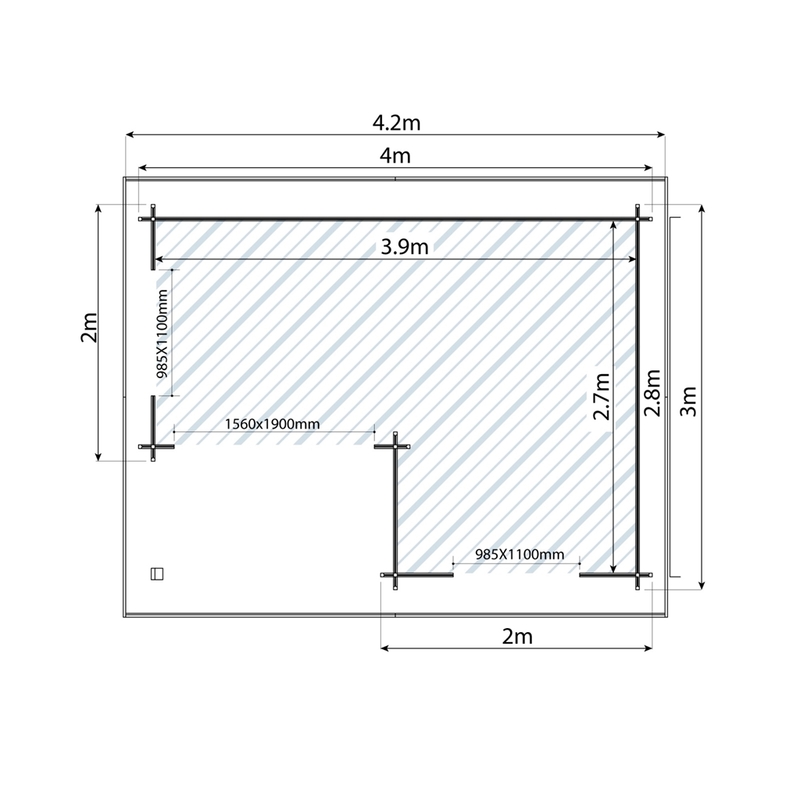 You may need to store the cabin for 24/48 hours prior to your arranged install date. Installation is normally 1-2 days with the team arriving at 7am to get a good start! (Coffee always appreciated). All products with installation will revert to our standard 21 working days delivery. You will be contacted to book in an install day. Product delivery and installation will take place on separate days. It is your responsibility to check that all the parts are present and correct, so that in the unlikely event that parts may be missing, incorrect, or damaged, you can ensure we have reasonable time to supply replacements (We aim to typically replace parts within seven days assuming replacement parts are in stock, however if we have to manufacture parts this time frame may be longer). Should you use a third party to carry out the installation please ensure that you give them sufficient time to familiarize themselves with the material and instructions supplied, that all the parts are present and that you have actually received the goods before committing to an installation date. A. Our delivery team aim to contact you 24-48 hours before the date of delivery if you have not used the online booking tool. We kindly ask that you please do not call the team prior to this time frame. A. Please use our “Live Online Booking Tool” where available. For products that do not have an live online date available - we can put in requested dates for you however they are only requested and cannot be guaranteed, we would normally call to confirm about 48hours before. A. We are able to provide AM/PM slots to most postcodes – please select this option where available. For products where we are unable to provide an AM/PM slots - our deliveries are classed as all day, between the hours of 7am to 7pm. However, Our Delivery Team can request the driver to contact you on the day of delivery to give you an estimated time of their arrival but this is purely an estimate as we cannot accommodate unforeseen circumstances. A. If your delivery is to an offshore island; Orkney's. Deliveries can only be made to the nearest carrier company at port (it is the customer’s responsibility to arrange onward delivery). We need to be aware of both the carrier company and also the forwarding address for the delivery to be made. We do deliver to the Channel Islands, Ireland, Isle of Wight and the Isle of Skye directly (at an additional cost, please see guidelines above) Port postcodes stated are except from normal postcode charges. If the delivery is to a port then the Port drop only charge must be added to your delivery cost. A. Generally we offer a 1 - 10 working days lead time, however please refer to the product in question via this website which should outline the most up to date lead-time estimation. Try our online booking delivery tool where available. Variations to this time do apply in extenuating circumstances. We will endeavour to contact you at the soonest possible time to arrange the next available delivery date for you. A. In most circumstances we do deliver at weekends. Q. What About a Log Cabin Delivery? **Please note that all deliveries to Ireland, some highland areas and any offshore address will be subject to an extended lead-time. Most off shore islands are a port drop only. Please call before you order. Delivery is usually very easy and straightforward. We state 10 Working days delivery schedule on each product page. We can often deliver to specified dates, but cannot guarantee this. Customers will always be contacted at least 24 hours before delivery and be given the date and approximate time of delivery. If you need more notice than this - please let us know at the point of ordering. Delivery is Free of Charge to UK mainland addresses provided the following points can be met. 1. Delivery is normally made by a 6 Wheeler Truck with a "Piggy-Back" forklift on board to unload the cabin, however, certain hauliers used in the delivery of Log Cabins do not have this facility (If in doubt - please contact us on 020 3198 1115 to discuss). 2. There must be sufficient space for this vehicle to operate. (If in doubt - please contact us on 020 3198 1115 to discuss). If the Cabin cannot be off-loaded due to a lack of space - a delivery charge may apply.